As Strasbourg continue to push towards the European places, key to their rise up the table has been the form of Ibrahima Sissoko. The 21-year-old midfielder has had a direct hand in five league goals this season, three of which have come in his last six outings, with a goal and an assist in in a 5-1 win over Monaco in that run a highlight. Indeed, Sissoko’s solid showings in that run has returned a WhoScored rating of 7.37. Remaining in Ligue 1, this time with Reims wingers Mathieu Cafaro, who is been in good form of late. The 21-year-old has returned a WhoScored rating of 7.42 in his last six league appearances having had a direct hand in each of his last three Ligue 1 outings, scoring one and assisting three in that run. Man of the match awards in wins over Guingamp and Marseille in standout displays means he’s ninth in the U21 player form rankings. Real Madrid closed the gap on Barcelona at the La Liga summit to six points with a 3-1 win at rivals Atletico Madrid on Saturday, with teenager Vinicius Junior earning his sixth La Liga start of his career in the victory at the Wanda Metropolitano. The Brazilian didn’t enjoy a standout performance in the victory, but his rating over his last six league appearances (7.45) is enough to make the top 10. Lille youngster Rafael Leao has now had a direct hand in seven goals in his last seven league matches as he netted once more in a 2-0 win over Guingamp. The man of the match display, his first of the season, helped push his WhoScored rating to 7.49 as Lille maintain their push for a Champions League finish in France. Borussia Dortmund squandered a 3-0 lead over Hoffenheim on Saturday to extend their winless run to three matches, but it was another solid performance from full-back Achraf Hakimi, whose display in the stalemate pushed his WhoScored rating up to 7.65 in his last six appearances. He’ll hope to continue his good form when Dortmund travel to Tottenham for their Champions League tie on Wednesday night. Edging Hakimi into the top five is Roma teenager Nicolo Zaniolo. The 19-year-old midfielder continues to impress when called upon by Eusebio Di Francesco, with Roma losing only one of their 11 matches Zaniolo has started, and his good performances of late, having had a direct hand in five goals in his last six league matches, has helped him gain a WhoScored rating of 7.76. There’s greater pressure on Kylian Mbappe to perform at Manchester United tonight given the absences of Edinson Cavani and Neymar, but PSG can rest easy knowing the French youngster has impressed of late. Indeed, his WhoScored rating of late is a notable 7.90 having scored six and assisted two in his last six league matches. 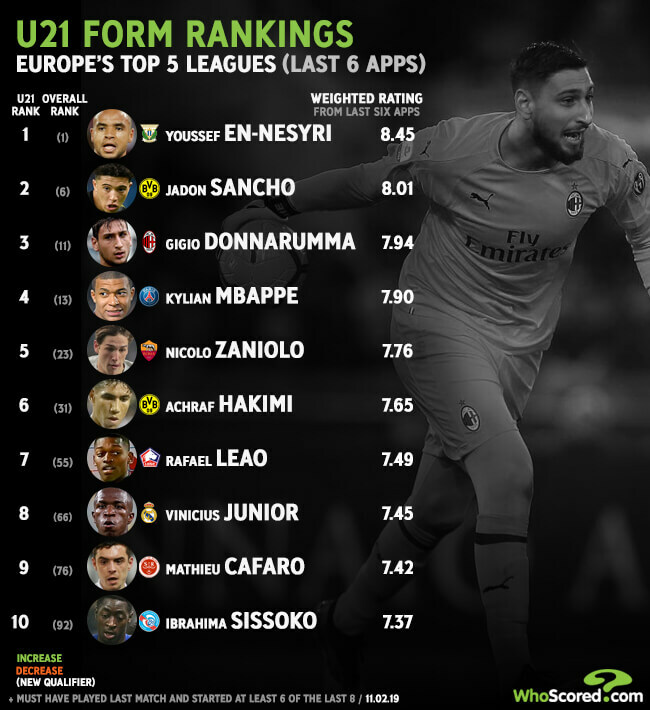 Pipping Mbappe to third is AC Milan goalkeeper Gianluigi Donnarumma, with the young shotstopper performing to the best of his ability in recent weeks. The 19-year-old has been hugely influential between the sticks, landing man of the match awards in meetings with Genoa, Napoli and Roma. Four clean sheets in his last six has helped land a WhoScored rating of 7.94. The second Borussia Dortmund player to make the cut, Jadon Sancho netted his seventh goal of the season in a man of the match display against Hoffenheim. The 18-year-old has now won the WhoScored man of the match award in three of his last six league outings, while two goals and two assists has helped him secure a return of 8.01. Be wary, Tottenham. Leganes forward Youssef En-Nesyri has been in sensational form of late having had a direct hand in eight goals in his last five league matches, scoring seven. His excellent goalscoring record has yielded a WhoScored rating of 8.45 across his last six La Liga matches, that not only top of the U21 form rankings, but also the form standings in Europe’s top five leagues. Only ratings taken from each player’s last six league matches are considered, weighted chronologically, with the most recent match carrying greater importance and so on. To qualify each player must have featured in their side’s last league game and started at least six of the last eight available. 4. Kalidou Koulibaly: Is he the centre-back Manchester United need? 5. How did Norwich City become so dominant in the Championship?